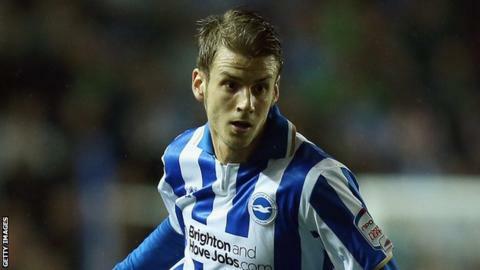 Andrea Orlandi says Brighton will have to learn to deal with sides trying to frustrate them at the Amex Stadium. The Seagulls have slipped off the top of the Championship table after picking up just one point from home games against Birmingham and Ipswich. The midfielder told BBC Sussex: "When teams come here they just try to stop us. That's their aim. "You have to stick to your principles. That's they way football should be played and what we have to keep doing." He added: "It's going to be hard for us, especially at the Amex. "It's something I experienced before at Swansea. Teams used to come to the Liberty Stadium, drop [deep] and wait for a counter attack. "They didn't do anything other than defend." Albion suffered their first home defeat of the new season on Saturday, losing 1-0 to Birmingham, and needed a late goal from Will Buckley to salvage a 1-1 draw against Ipswich on Tuesday. The Spaniard says they will have to improve at both ends of the pitch when they play their next home game, at home to Middlesbrough, after the international break. "We have to make sure we don't concede sloppy goals, especially before we can score one," the 28-year-old continued. "We didn't create much [on Tuesday]. We didn't play as well as we could and Ipswich made our lives hard. "That's what we have to address and we need to be more focused. "Once we get one, teams will have to open up and it will be easier to play."